HIH ART STUDIO offers a specialized range of museum / collection quality, limited and unlimited edition fine book publishing and printing services. Our specialty is limited collector’s edition book design, (writing / editing on request). We stay with you from concept to finished book. HIH ART STUDIO also serves custom oversize and large / small quantity run book design and publishing projects. HIH ART STUDIO serves individual and corporate clients. We welcome difficult printing jobs that require a high level of expertise at a reasonable cost. 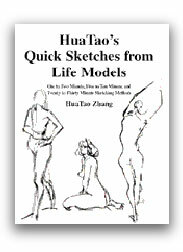 This simple, yet elegant book is a collection of sketches drawn in 1-2 minute, 5-10 minute, and 20-30 minute sittings, using life models. It is also a practical guide to developing a technique for capturing mood, movement, form, anatomy and lighting. Details about materials used by the artist are included in an index at the back of the book. Drawing technique suggestions are included at the beginning of each of the three sections. HuaTao’s message to the aspiring artist: make drawings fresh and realistic by using simple methods. Humans have many changing moods and expressions, and HuaTao Zhang shows how to capture these spontaneously and quickly. Immersion in the drawing experience leads to the best results. HuaTao calls this a "happy accident." The graceful and delicate style of HuaTao’s drawings gives insight to the aspiring artist and pleasure to all readers. Dimensions: 13.8" x 10.5" x 0.6"
Park Merrill is a lifelong painter. He contributes originality and style to the world of art through his paintings. He successfully blends realistic with impressionistic beauty, and invites the viewer to step out of a conventional world, laden with predictable images, and enter a world of unexpected visions. In his paintings, realism merges with disarming impressionistic beauty to challenge the imagination. The gentle and imaginative style of Park Merrill's paintings calls on each of us to be ever-inspired by the beauty in our thoughts, and in our world. This gorgeous book is a collection of paintings and drawings on Romantic Fantasy, Land and Seascapes, Portraits, Drawings and a special Instructional Section, with poetic narratives to guide you through the paintings. This book has something for everybody. 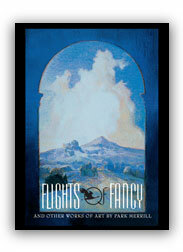 The publishing workmanship on Flights of Fancy and Other Works of Art by Park Merrill is very high quality. There are six sections in the book: Introduction, Romantic Fantasy, Of Land and Sea, Portraits, Drawings, and Instructional. The author guides you through his artwork in brief, but thoughtful and poetic narratives.You are invited to use your imagination in interpreting his paintings. In the Instructional section, Merrill shares his Twenty-Eight Principles with the reader, maintaining, "One cannot paint a picture without first mastering the Twenty-Eight Principles for Picture-Making." Park Merrill was educated at the Art Center College of Design in Los Angeles. He was also on the teaching staff there for several years. Much of his career was spent as an art director at Lockheed Missiles & Space Company, Inc., in Sunnyvale, California. Clients include Del Webb, the Hill family, of Hills Bro's. Coffee and private collectors. His paintings are displayed in Auburn, the Bay Area and Carmel. 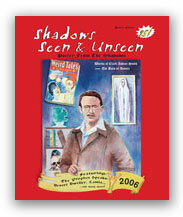 Dimensions: 13.8" x 10.4" x 0.6"
The mysterious life of Smith is finally illuminated in this lovingly crafted compendium. A contemporary of Robert E. Howard and H. P. Lovecraft, Smith wrote some of the strangest tales ever to grace the pages of the legendary Weird Tales magazine. Here, his delicate watercolors and surreal poems give a glimpse of the man behind the stories. Complete with interviews, reproductions of his original typewritten poems and photos galore, this is as close as anyone will ever come to knowing the Bard of Auburn. This is a must have for all Smith aficionados or fans of fine art, prose and poetry. Collected and compiled by Ray Johnson. Johnson did a fabulous job of putting this book together an artist in his own right. The layout and design is very nice indeed. Most impressive and highly recommended. HIH Art Studio 2007. First edition. Limited. Hardcover. New in dust jacket and slipcase. Full-color works. One of 40 limited editions signed by Raymond L. Johnson and Ardath W. Winterowd. Destined to be a very tough find indeed. Dimensions: 11" x 8" x 0.56"